we really spend about four nights in Bangkok, but the lyrics from Murray Head "One Night in Bangkok" had been stuck in my head pretty much since I booked the flights from London Heathrow to Suvarnabhumi Airport. Surely just four nights can't do justice to such a vibrant and cultural hotspot like Bangkok, a melting pot of locals and travellers, backpackers and professionals, buddhists, muslims and christians, rich and poor. I love the vibe of big cities, tall buildings and hidden alleys that invite you to loose yourself, and Bangkok was no exception. We arrived in Bangkok in the late afternoon. Being quite hungry after the 12 hour flight we decided to visit Khao San Road for food and some drinks. In the last years Khao San Road suffered for being known as a cheap place for backpackers and mass tourism, Wikipedia describes it as "world famous backpacker ghetto". Despite its reputation we actually quite enjoyed our first night with some great Pad Thai and coconut juice straight out of a coconut. After a good nights sleep and some coffee we started our first day with a trip to the Maeklong Railway Market which is located about 40 miles Northwest from Bangkok. The market is completely build on and around the tracks of the train. 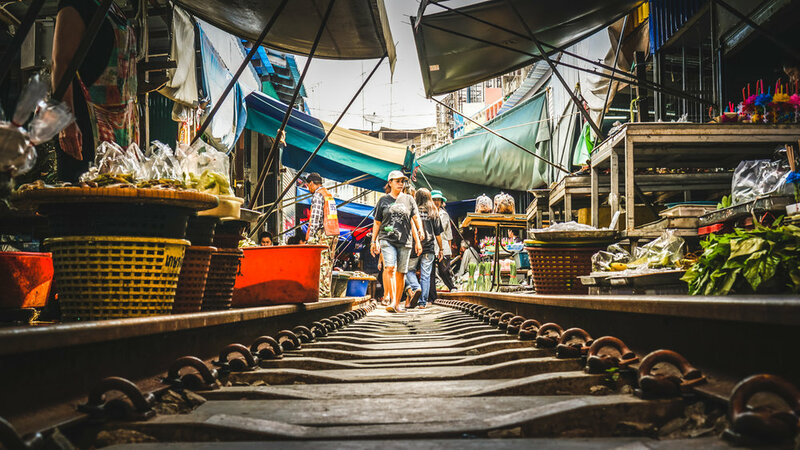 It is quite a sight when the train, which operated once per hour, slowly runs through the narrow alleys of market stalls between farmers, locals and tourists. Next we headed to the Amphawa Floating Market which is just a few miles away and quite a unique market experience as most of the trades are happening on and off boats. I would recommend to do a boat tour through the market canals and explore the nearby areas. There are a lot of amazing temples hidden around the banks of the river. We ended our day with a pretty amazing freshly prepared seafood dinner in the heart of the market. The market tour was definitely one of the highlight of our trip, even though they are a bit further away it's definitely worth the time. The following day we wanted to spend some more time in Bangkok and explore the city on our own. First on our list was the Grand Palace which is located in the heart of Bangkok and luckily within walking distance from our hotel (walking distance however quickly decreases with 35 degree temperatures and 80% humidity). The palace is the official residence of the royal family and probably one of the busiest attractions in town. An audio guide which can be rented at the entrance is highly recommended. Temperatures and humidity started getting to us so we decided to take a Tuk-Tuk back to our hotel for a refreshing swim in the pool and some snacks, of course complimented by a fresh coconut. We both really enjoyed the rides with the Tuk-Tuk. Generally the traffic in Bangkok can be really bad (and I'm from London, I've seen bad traffic), as bad as nothing's gonna move for what feels like 10-15 minutes. Tuk-Tuks however can use shortcuts, move around cars and avoid being stuck for too long. And at the same time there a lot of fun as you're pretty much on the back of a motorcycle. It's not super comfortable and due to all the pollution I wouldn't use it for rides longer than a few miles. After a refreshing break we felt confident enough to visit Wat Pho, one of Bangkok's biggest buddhist temples. It's most famous for exhibiting the worlds larges statue of Buddha, also know as the Reclining Buddha. Additionally it contains the worlds largest collection of Buddha images. From the Wat Pho we took the ferry to one of the weekend and flower markets in the old town of Bangkok. The ferry was a refreshing and recharging alternative to the jammed roads and you also get to see the city from a totally different perspective. You will be surprised how relatively quiet the markets are. 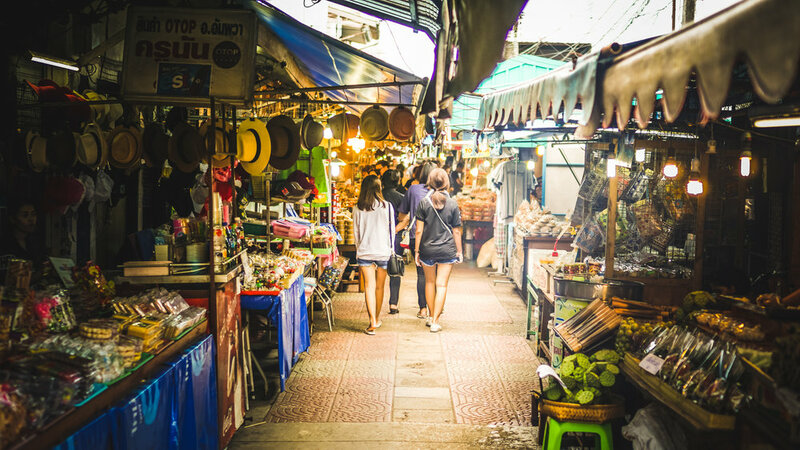 There's almost a relaxing and unwinding atmosphere, unlike in other parts of the world there's almost no hustling which makes up for a really laid-back shopping experience. And if you love coconuts as much as I do I highly recommend coconut ice-cream out of a fresh coconut. Unbeatable. One of the highlights of the day was definitely our sundowner at the Cloud47, a rooftop bar in the new town of Bangkok. With affordable prices, surprisingly few tourists and a very casual atmosphere (no dress-code needed) this place should be on everyones list when coming here. If you read carefully you might have noticed that so far we've had three out of four nights. The reason for that is that after our first three nights we left Bangkok towards Chiang Mai to continue our trip through Thailand. But at the end before our flight back to London we shall be back for truly only One Night in Bangkok. 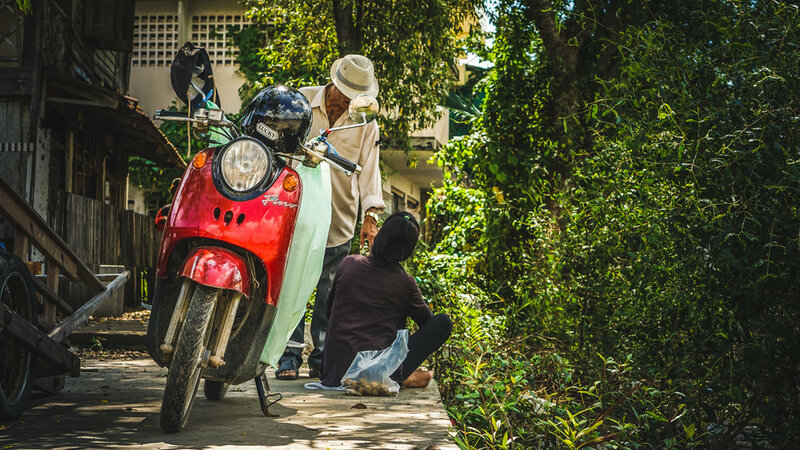 If you're really impatient and can't wait to see more head over to our Instagram to see more pictures from the rest of our journey through Thailand and the rest of the world.